I recently read Persuasion cover to cover for the first time. While reading the continual mentions of pride and the constant showing of prejudice struck me. Someday (soon, I hope) I’ll do a post about my opinions while reading Persuasion, but for this post I decided to search for mentions of persuasion in Pride and Prejudice. My annotated version has a note from Dr. Shepard that explains this was a theme dear to Miss Austen since it is the title of one of her later books. As it turns out, there’s quite a bit of persuasion and persuading happening in Pride and Prejudice, so I will only focus on the situation of potential marriages. The first potential marriage we know of in the book is Mrs. Bennet’s hopes for Bingley to marry Jane. At every turn, Mrs. Bennet is attempting to persuade her new neighbors, who frequent London and care for high fashion and high society, that a girl from little old Meryton– and with fifty pounds to her name– is just as good as anyone you might meet in London. We never really know how Bingley would have replied to this form of persuasion because his friends and family convince him to stay in London and he essentially never has to answer the question Mrs. Bennet poses him. Yes, he does return, but who knows what Bingley would have done if left alone and not separated from Jane for months. Mrs. Gardiner points out that attachments often fizzle out. What is clear, is that Mrs. Bennet doesn’t seem to take the feelings of either Jane or Bingley into consideration for her plans. Immediately upon hearing he has no plans to return, Elizabeth believes Miss Bingley and Mr. Darcy coerced Bingley into staying. For a time, Elizabeth is angry even at Bingley for his lack of resolve. When she is led to believe that Darcy boasted of his arts in separating Bingley and Jane, she is angered that Darcy felt himself sufficient judge of what would make Bingley happy. Later we learn he may be innocent of that, but he is at least guilty of assuming he understood Jane’s feelings. The next example of a potential marriage is Mr. Collins’ proposal to Elizabeth. He spends very little time trying to convince her that he is a good match, instead most of the scene is Elizabeth attempting to convince him that she is serious and capable of judging for herself on the matter. As he refuses to hear her words, she leaves the room, and finally her father agrees with her decision without any real tension or anxiety. is a stark contrast to her experience with Mr. Collins. Their next meeting is not a letter requesting she reconsider, as Collins had approached her parents, but instead an explanation and defense of his character. Just when Darcy and Elizabeth meet again, and all seems to be going well for them, Lydia elopes with Wickham. We don’t know all of the specifics but it’s quite clear that Wickham had no plans to marry Lydia, at least not without financial assistance. We cannot be certain of the exact amount Darcy spent to arrange the matter, but his special form of persuasion seemed to speak louder to Wickham than all of Lydia’s wishes. Lady Catherine also tries her hand at arranging- or not arranging- a marriage. The strongest battle of wills in the book is not on the issue of consent but the topic of availability. Lady Catherine asserts that Darcy is both engaged to her daughter and that Elizabeth is unsuitable for him. Elizabeth vehemently argues that she has every right to marry him should he ask. At last, in the final disagreement over the matter of marriage, Elizabeth has to convince her father to not just consent but to be happy about the marriage. For the first time in all the arguments, the answer is solved with the simple explanation of love. She loves him. Therefore, her father should allow the marriage. What makes Darcy such a brilliant match for Elizabeth is that out of all these situations, including with her father, he is the only one who respected Elizabeth’s opinion and did not try to change her mind. However, through life experience and facts, Elizabeth changes her mind on Darcy without the input of others. It’s quite different from Persuasion, but the theme is very much alive and well in Pride and Prejudice. In the end, both Elizabeth Bennet and Anne Eliot have to go through quite a bit of change and experiences to overcome those that would use persuasion against them. Now, I’d like to persuade you all to try my next release. Love Lasts Longest is a short story collection and will be out by October 1. Journey with Darcy and Elizabeth as they fall in love in 9 unique circumstances. Comment below to be entered for a chance to win one ebook copy! Feel free to download and share the memes! Now I have to go through all of my copies of P&P to see if that write error woo word italicized. Great post! Sounds intriguing. I loved the essay on the persuasion in Pride and Prejudice. Thank you. Ah, my two most favourite books in the world. 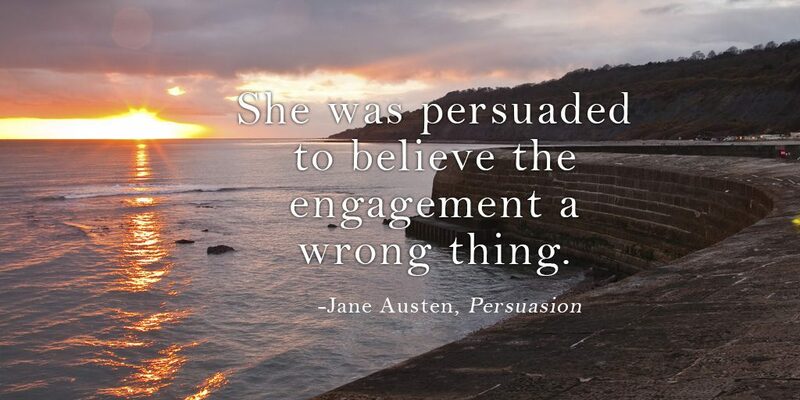 I’m glad you have now read Persuasion. I had never considered the connection before. Thanks for a thought provoking post.